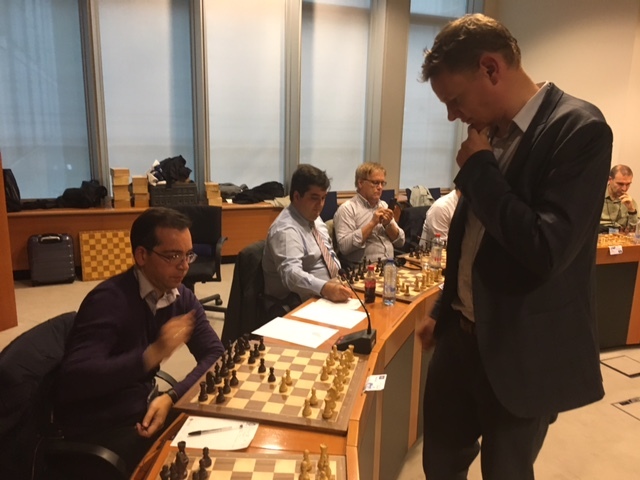 With the German Grandmaster Jan Gustafsson (ELO 2640) Europchess had invited on 8 September 2017 one of the best-known and fun chess-commentators of these days. 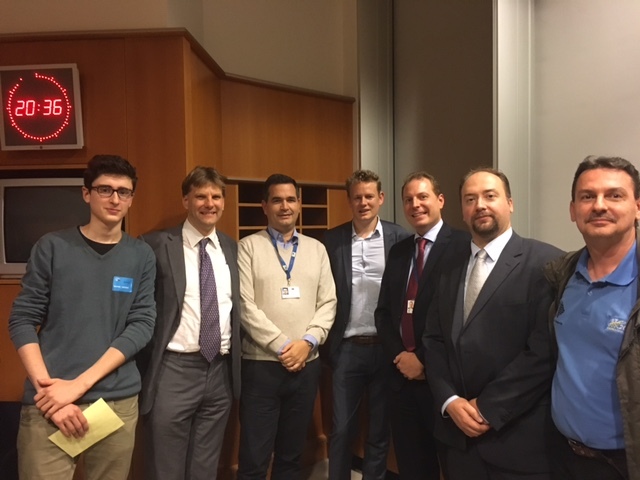 Under the auspices of the German Vice-President of the European Parliament, Alexander Graf Lambsdorff, we held the event at the premises of the European Parliament. 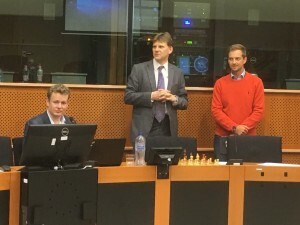 The MEP’s assistant Christian Kroekel welcomed Gustafsson on behalf of the Parliament, and Europchess President Frank Hoffmeister introduced the guest of honour. Born in 1979, Jan had become a leading youth player in Hamburg, winning the federal championships in the age categories of under 13, 15, 17 years, respectively. In 1999, he became an International Master and with 24 years a Grandmaster. Importantly, he joined the national team afterwards. According to his words, the biggest success was the victory with the German team at the 2011 European Team Championships. 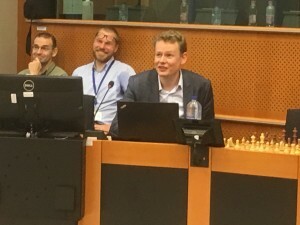 Europchess was thus happy that he commented two games from this memorable event – one against the 2700 heavyweight GM Efimenko and one against the strong Hungarian GM Csaba Balogh. He demonstrated how deep his opening preparation went with White; at the same time, the highly complicated and unbalanced middle-game positions required strong tactical skills. Moreover, in the second game, Gustafsson had to overcome also peculiar problems in the ending. Benefitting from his easy-going and fresh commentator-style, Jan explained to us the games with humour and self-irony. 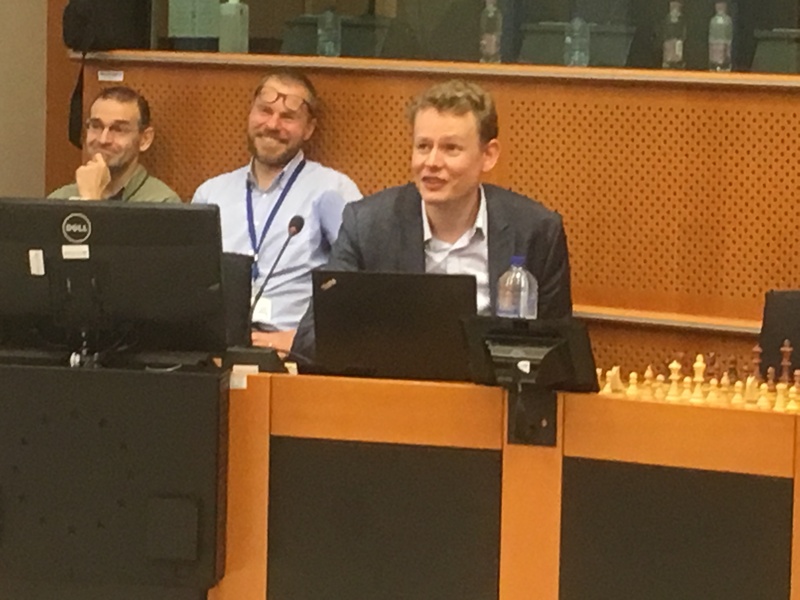 At the same time, the chess content was so fascinating that everybody was highly satisfied to have seen the star commentator live in action. 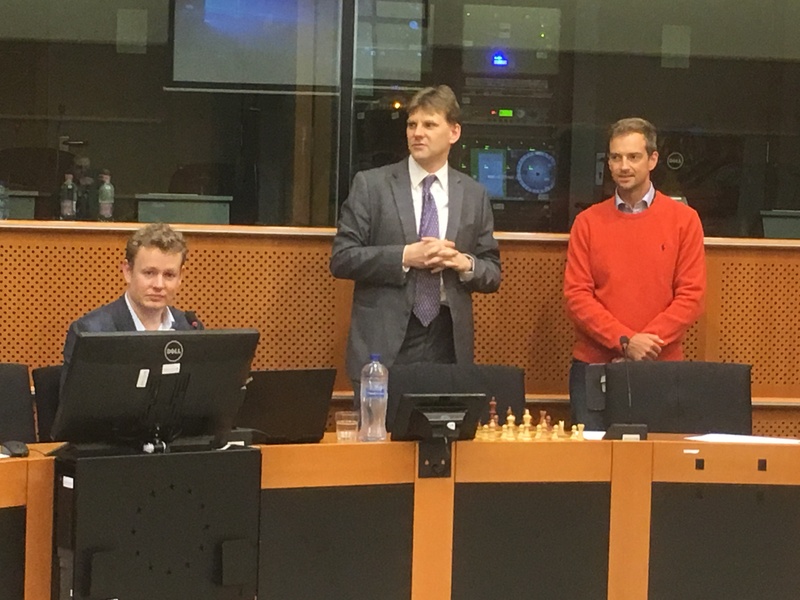 After this sparkling lecture, the grandmaster then proceeded to the tougher part of the event: he faced 20 club members in a simultaneous exhibition, who have already proven their playing strength in previous years. 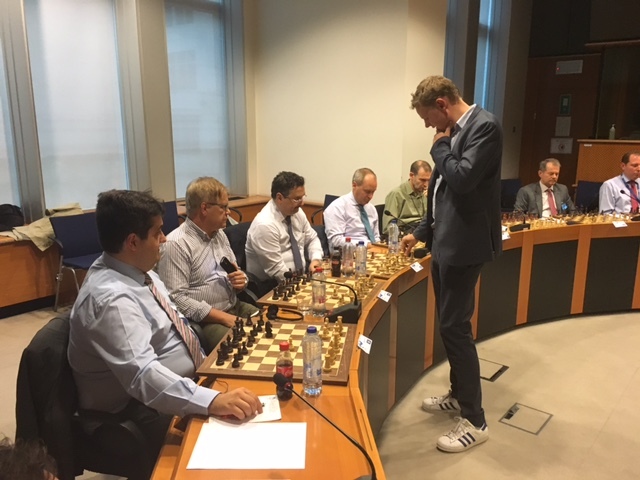 We could also feel that he took the exercise seriously as he opened predominantly with 1.d4 – and not 1.e4, which he might have played when facing a different set of lower-rated opponents, as he had revealed in his lecture beforehand. 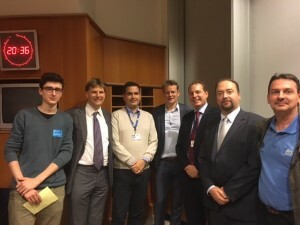 And indeed, Europchess members showed teeth on several accounts. Johannes Bertram, Luis Parreira and Frank Hoffmeister had good winning chances, by either having a material or positional advantage. However, Gustafsson bounced back and saved all the three games to a draw. Matija Suskovic forced a draw, whereas Jozsef Barta, and Carlo Russian held their slightly inferior positions together. Apart from these six draws, however, Gustafsson overcame considerable resistance, including from club champion Georgi Tomov, the 2nd division players from our club (Benjamin Alberola) and the CREB (Jenö Czuczai) and the captain of the 2nd team Mattias Johansson. All in all, the fight took more than 4 hours and ended with a 17:3 win for Gustafsson! Afterwards, some players enjoyed Jan’s company at an Italian restaurant for dinner, where anecdotes and jokes flourished around some pizzas and beers. We were thus very pleased to have learned a lot and spent an exciting chess day with one of the greatest contemporary German chess players. It’s always a plessure listening to Jan and watching him play.